I’m “Southern,” so there are certain realities about myself that I have come to accept. I sometimes drop the “g” from the ends of words. I’m never “about to” do something, but rather, I’m “fixin’ to,” and yes, I enjoy the occasional fried food. However, one of the things that I think most defines southern culture is the importance of family. For the most part, Southerners tend to have very close ties to their extended families. I grew up seeing my aunts and uncles regularly, and my cousins are also among my circle of best friends. However, I had a special relationship with my grandparents. I saw them nearly every weekend growing up. I received an invaluable education from them about the past, about respect for the wisdom they could share with me, and it was a gift to be able to assist and comfort them as they grew older, and eventually died. One of the biggest surprises I’ve ever had was that I learned that reverence paid to elders in the South was very similar to that in Japanese culture. I was in Japan a few years ago, and had the opportunity to stay with a family in Hitachi. I was told that the family may or may not speak English, but otherwise I knew nothing about them. Our initial meeting was nothing short of awkward. A social gatherings was arranged between the group of people I was traveling with and the families we would be staying with. Our group manager quickly paired us off and that was when I met Keiko. She spoke very little English, and I spoke no Japanese. She was alone, and after a very stressful car ride back to her home, I had figured out that her husband spoke English, was a college professor, but was working late, and hadn’t been able to come with her to pick me up. Relieved to learn that the next few days wouldn’t be as difficult as I had initially predicted, I unloaded the car and was shown to my room. Keiko left me to unpack and to prepare dinner. Jetlag was slowly beginning to overcome me as it tended to do in the early evening while I was adjusting to the drastic time change. Maybe it was that, or maybe it was my forced attempt at repacking my suitcase, but I had neither heard nor noticed the small elderly woman that had come into my room behind me. When she spoke to me, in what I can only describe as rapid fire Japanese, I nearly jumped out my skin and spun around. I’m pretty sure my eyes bugged out of my head, and I must have looked completely bewildered. She was smiling and chatting away at ninety miles an hour, and I simply stared. What in the world was she saying? Was I in her room? Who was she? It was then that an elderly man shuffled into the room behind her, and also be began talking, only he was talking to her. She waved him off dismissively, without ever stopping her one-sided conversation with me. After a minute or so, he reached up and gently laid a hand on her should and guided her back out of the bedroom. They turned a corner, and went into another room, and closed the door behind them. I couldn’t ask Keiko. It had taken her 30 minutes to explain to me that she was married, how on earth could she explain two senior citizens that walked into my room, chatted me up and the disappeared behind a large, rather formidable looking black door at the end of the hallway? A little while later, Keiko came to my room and motioned that I follow her to the dinning room. We sat on tatami mats on the floor and ate an assortment of green leafy things and fried something-or-others that were unrecognizable to me. The boiling hot miso soup flowed, and after dinner we moved into the seating area where I was asked to sit in a mechanized massage chair that was placed in the corner. She smiled and turned the torture device on, and it slowly, painfully, kneed me like the toughest, driest bread known to man. While I was being painfully stretched, the door opened and Binko arrived home. Binko, a lean middle-aged man, kissed Keiko on the cheek, and walked over to pull me from the chair and shake my hand. In crystal clear English, he introduced himself and apologized for being late. We all returned to the tatami mats of the dinning room and talked while he ate dinner. We chatted for an hour or so about America and Japan, ourselves, and my jetlag. Eventually, I worked up the courage to ask about the elderly couple, and he explained that they were his parents who lived on the other on the other side of the house. It was essentially a duplex and he kept an eye on them in case they needed something. This had also been a useful arrangement as they had been very involved in the raising of Binko and Keiko’s son and daughter. Relieved to know that it hadn’t been a jetlag induced hallucination, I excused myself as Binko was finishing, to turn in for the night. Jetlag was proving successful at wearing me down. It wasn’t yet 8:00p.m., but I knew I was done for the day. After a while, I did see a large crow digging through a trash bag that had been left on the street corner. I somehow found the normalcy of the image comforting. Of course when I finally looked up, I was completely lost. Retracing my steps, and missteps, took me back to the house, and I quietly opened the front door. As the door slowly slid open, I pulled my shoes off to enter the home, and then looked up. Perfectly framed in the hallway beyond the door, was the elderly woman. She smiled and motioned her hand for me to follow. I couldn’t be certain, but I think she had been waiting for me to return from my early morning jaunt. As I walked in, she began talking to me again, in a very fast, very clipped Japanese. She lead me to the black door at the end of the hallway, and pushed it open revealing a kitchen. Binko and Keiko’s kitchen had a warm modern Asian-suburban aura about it, but this side of the house was different. There were doilies on the countertops, and glassware, china, and silver pieces were piled up in various spots. In short, this was my grandmother’s kitchen. Eight thousand miles away from home, and yet it seemed so familiar. Both had the same mood and feel. Then it hit me- the little old lady before me was the same height as my grandmother, and seemed to have the same demeanor. Both were forces of nature and neither would let something like not speaking another language stop them from being hospitable. Just like that, I was smitten. This woman was my new Japanese grandmother. I began to think of her as “Grandmama-san.” In Japanese, “-san” is a suffix that essentially means “Mr.” or “Mrs.” And is used to show respect. She was now Mrs. Grandmother to me, and the old man sitting at the low lung table in the center of the kitchen was Grandpapa-san. Grandmama-san began doting around the kitchen, opening cabinets and pulling food out. Grandpapa-san pointed at the spot next to him at the table, and I lowered myself onto the cushion on the mat on the floor. The table had been covered with a large heavy quilt that fell over each side, and piled up around it on each side. He reached over, smiled, and pulled up the blanket in front of me, and directed me to slide my legs under the table. I did as I was told and found that there was a shallow hole under the table for our feet to hang down into, and a small heater was keeping the area toasty warm. Grandmama-san crossed over and placed a plate in front of me with a sliced apple on it, and poured me a cup of green tea. Grandpapa-san passed me a section of the local newspaper. Grandmama-san joined us at the table. As I flipped through the paper examining the foreign script and pictures, they turned on a T.V. nearby and watched a program that seemed to be a combination of a morning news program and “The Price Is Right.” I had no idea what was going on, but they seemed to really enjoy it and would occasionally point at the screen, laugh, and then speak to me (in Japanese) to explain the joke. I would smile and nod, and I felt like all was right with the world. I had only known three of my grandparents, and at this point at my life, two of them had died. I had become close to my maternal grandmother. I felt like we understood each other, and a lot of our relationship was based on my patience for her and a willingness to simply sit and listen to her. She, in turn, was grateful for the appreciative audience. When the game show/morning news program was over, so was breakfast. Grandmama-san pulled her legs out from under the blanket and began to clear the table. I got up to help her and she began to nod and bow gratefully. When everything was put away, she led me to the backyard and into her vegetable garden which was full of melons and peppers. My grandmother, and my parents regularly grew gardens in the summers, and I was well trained in assistant gardening. I began helping her pull weeds and picking everything that was ripe. The entire time she talked to me. At times she was laughing and at others, she seemed to be passing on life lessons and serious philosophies. Eventually, Binko found us in the garden and called us back inside. Grandmama-san bowed, smiled and walked back into her kitchen, closing the large black door behind her. I spent the rest of the morning with Binko and Keiko. We went on a road trip to visit a few of the smaller towns that surrounded Hitachi, an area known for it’s pottery, specifically tea pots and cups. We traveled to several factory stores and museums, sampling teas in each, stopping to take pictures of me in the bamboo forests on the side of the road, and stopped for a sushi lunch. On the way home, we went to the 100 ¥ Store, a sort of Japanese version of a very large Dollar Store in America, where everything (you guessed it) costs 100 ¥. As we rode along in the car, I learned a few things about Grandmama-san and Grandpapa-san. Before he retired, Grandpapa-san had been an executive with Hitachi, working at the company’s headquarters, and the namesake of the city. Grandmama-san hadn’t been a part of the corporate world. 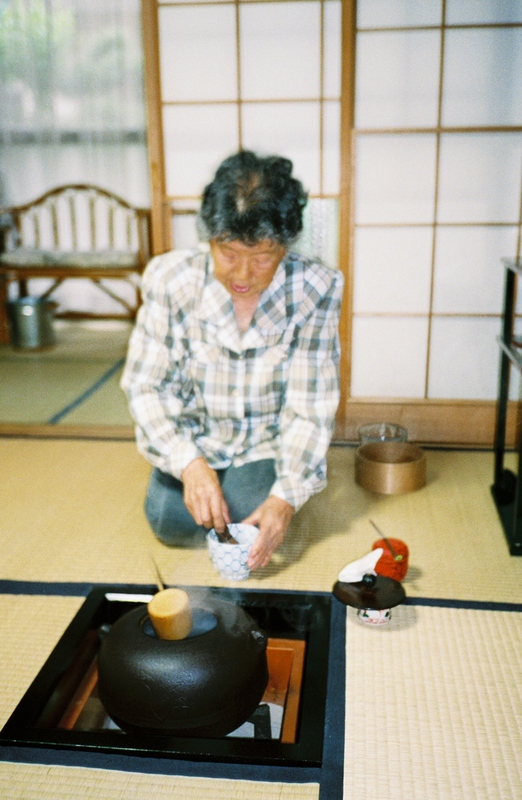 Instead she had spent her life studying the tea ceremony, and was well known for her mastery of the intricate process. In fact, she was so well known in Japan that she was in demand as a teacher of the ancient practice, but rarely had done so in recent years due to her advanced age. What I didn’t realize was that I was being carefully told these pearls of information to prepare me for what was waiting for me when we arrived home. When I walked into the dinning room, Grandmama-san was standing in the center of the room. She slowly and gracefully bowed to me, and Binko instructed me to return the gesture equally. Behind Grandmama-san, the previously sparsely decorated living room had been cleared of its furnishings, and the tatami mats had been rolled up and put away. Now, there was a large pit in the center of the room with a small fire burning. Hanging from the ceiling on a heavy chain, was a large black kettle filled with boiling water above the fire. Special calligraphy scrolls were now hanging on the walls. The outside wall, which a large screen blocked the night before, was now open to the elements, having been folded back to the edges of the room. The garden was now visible from the dining rom, and a quietly babbling fountain could be heard outside. What followed over the next three hours was one of the most powerful and moving experiences I have ever had. 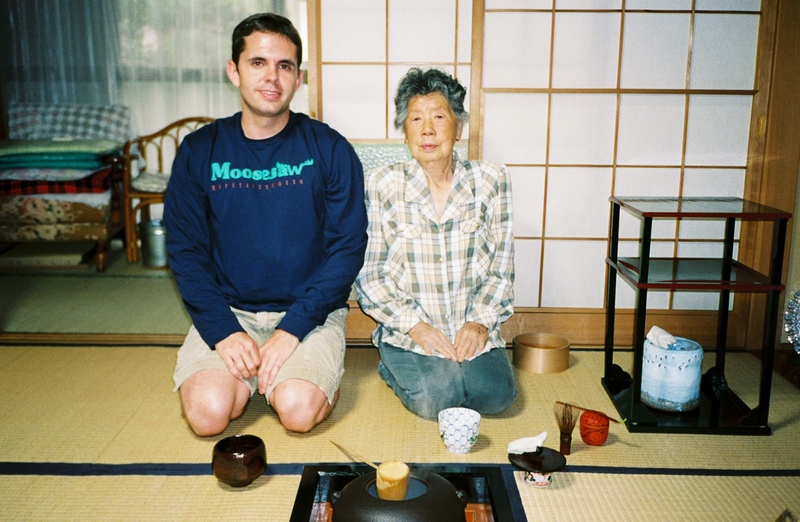 Grandmama-san performed the full Japanese tea ceremony in my honor. The ritual, and it is an almost a religious ritual in Japanese culture, is more than putting powdered tea into a cup and adding hot water. The ceremony dates back to the 1500s and is a meditative experience meant to create a balance of harmony, respect, and relaxation through very precise movements and actions. Every action is performed exactly and there are long standing traditions that are followed. I was led across the room and sat on one side of the prepared area across from Grandmama-san. Gone was her chatty, smiling demeanor. Now she was stoic, proud and supremely confident. I sat in the floor with my knees and feet under my body. She began by taking water from the pot and wetting a towel. She passed me the towel to clean my hands, and then she began. She slowly and deliberately moved through the ritual. She wiped out the bowels and cups, turned them, added the tea powder and water, mixed things and passed items to me, all part of the ceremony. Each step was accentuated with a bow and I was expected to reciprocate. Gummy textured sweets were served at one point, and the experience lasted well into the evening. When it was all over, she returned to her happy attitude and began chatting away at me. I helped her pack things up and moved the boxes of equipment to a storage closet in the corner of the room. As I was handing her the boxes, she began to pull more out. She showed me their contents; elaborate antique cups. They were beautiful. Some were ornate, and others were simple, but I smiled and nodded at the presentation of each, and this encouraged her to pull more out. She reminded me of my grandmother in so many ways. Binko eventually intervened and pulled me away, saying she would keep me there all day because she didn’t get much of a chance to show her collection to many people. I stayed in Hitatchi with Binko and Keiko for two more days, and I found my routine. Each morning began with a walk around town, although each was later than the one before as I became more acclimated to the time, but they were all still at an ungodly hour. Breakfast followed with Grandmama-san and Grandpapa-san. Then I would be taken sight seeing or even to a trip to the local Japanese bathhouse. I didn’t see much of my adopted grandparents after breakfast, but each night they would come to my bedroom door to speak to me (always in Japanese), and give me a piece of chocolate. When I left, they gave me a bag a goodies for the trip, and asked to have a picture taken with me. At the time it struck me as odd that they didn’t smile in the picture. A few years later, my grandmother died, and I looked back through the photos of her life. She wasn’t smiling either. Although, I have no idea of most of what was said to me while I was in Japan, I feel as though both of these women were cut from the same cloth. I was being watched over and doted on, both at home and away. It’s often said that life doesn’t give you what you want, it gives you what you need. If you’re lucky, those are the one in the same. It was only after comparing the pictures that I realized that my upbringing had prepared me to receive that kind of love so far from home. Such a great story, and a lovely tribute to two wonderful women.